Jeep is having a great year in terms of sales in 2011. In August 2011, its sales were 40,638 units, up 58% from August 2010. The automaker is hoping to the build on the success of its models and one such example is the 2012 Jeep Grand Cherokee SRT8, which is a niche luxury, performance play. The SRT8 is not your typical Jeep. This model is much more about on-road performance than off-road capability. With a massive 6.4-liter, 470 horsepower V8 engine, the SRT8 is one of the most powerful SUVs on the market and the most powerful Jeep ever. The hefty engine brings the model to a weight of about 5,200 pounds, but with 470 horsepower this model packs a serious punch. According to Motor Trend, the Grand Cherokee SRT8 has a 0-60 time of just 4.6 seconds. This is faster than more expensive high performance European SUV models such as the Land Rover Range Rover Sport Supercharged and Porsche Cayenne S.
The 2011 Grand Cherokee was all-new but did not feature the SRT8 in its lineup. The 2010 Grand Cherokee SRT8 featured a 6.1-liter 420 horsepower V8. It had mighty power but paltry fuel economy of 11-mpg city and 14-mpg highway. The 2012 SRT8 is expected to better in this department with estimated fuel economy of 12-mpg city and 18-mpg highway but still only has a five-speed automatic transmission with paddle shifters. 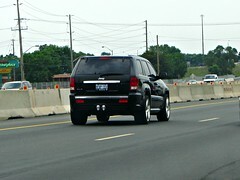 If you are inclined to tow a trailer or boat with this high performance SUV, the SRT8 can tow up to 5,000 pounds. In terms of comparing the SRT8 to the Porsche Cayenne SUV, the SRT8 bests the Cayenne S in performance times despite costing more than $8,000 less. The 2011 Cayenne S has a 4.8-liter 400 horsepower engine, which does get much better fuel economy at 16-mpg city and 22-mpg highway, largely thanks to its 8-speed automatic transmission. Only once you step up to the Cayenne Turbo, which costs more than $100,000 and has 500 horsepower, do you get superior SUV performance to the very powerful SRT8. The SRT8 is expected to have a starting price of about $57,000. Leather seats, carbon fiber interior accents, heated front and rear seats, ventilated front seats, 20” wheels, all-wheel drive, and bi-xenon headlights come standard but sunroof and navigation are optional features. The SRT8 trim with essentially the same engine is also seen in other Chrysler products such as the 2012 Chrysler 300 SRT8 and the 2012 Dodge Charger ST8. The Grand Cherokee SRT8 has very similar performance numbers to these two cars but costs about $10,000 more. 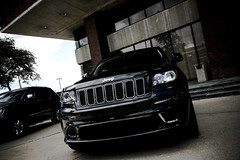 As with all 2012 Grand Cherokees, the SRT8 is assembled at Chrysler’s Jefferson Avenue North Plant in Detroit, Michigan. The model’s engine is assembled at the Saltillo Engine Plant in Saltillo, Coahuila, Mexico. Which model would you prefer to own?